A new design has been proposed for the bike lane on Harbord Street. The bike lane on Harbord is currently intermittent, switching from a full bike lane to sharrows between some major intersections. 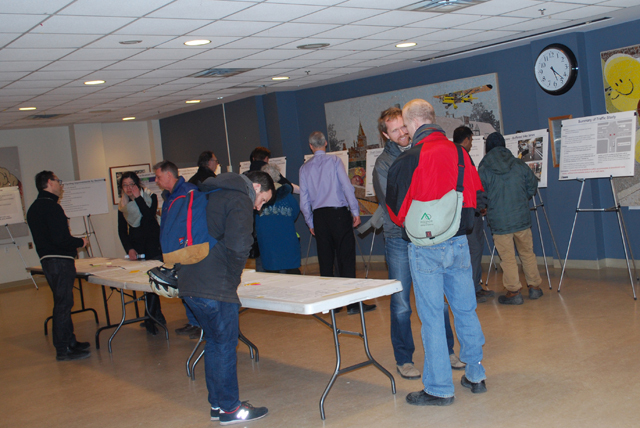 A redesign has been in the works since 2012, and a bulletin board noted that Harbord was the second busiest cycling route in Toronto (following College Street) with cyclists representing 40% of rush hour traffic. Harbord also carries a lot of car traffic. A previous design, proposed in June 2013, looked at installing a physically separated Montreal-style bi-directional lane on the north side of the street, but the plan was scrapped due to too many conflict points for turning traffic, and resistance from (some certain) business owners and residents on the potential loss of on-street parking. Daniel Egan, manager of Toronto's cycling infrastructure and programs, doesn't rule out the possibility of bi-directional lanes altogether, but feels they'd be better suited for one-way streets. "This has been an interesting process, because we really thought we might be able to make bi-directional work here, because there aren't that many major intersections. But we had pretty mixed reactions from cyclists, half of them loved it and half of them hated it and there wasn't much in between. To go with something where we have to take up all the parking and put up physical separation that makes it a much slower street for cyclists, that kind of defeats the purpose." 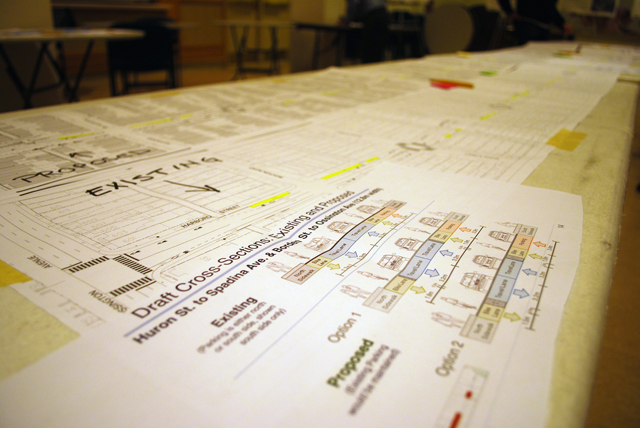 The new plans recommend continuous uni-directional buffered bike lanes to replace the sharrows which currently exist between Spadina Avenue and Borden Street, and at the Bathurst Street and Ossington Avenue intersections, while still maintaining on-street parking on one side of the street, and increasing the side street parking currently available. These upgrades will not require changes to traffic signals or TTC stops. "I've gotten into a lot of near accidents on Harbord, especially between Spadina and Bathurst -- cars don't respect sharrows at all," says Ashley Quan, who travels on Harbord at least once a day. She's in favour of the changes, but also says, "I definitely think that more so than this, Bloor Street needs bike lanes. When I'm going east it's a death trap." On Hoskin Avenue, which is wider than Harbord Street, a wider buffered bike lane has been proposed. The buffered bike lane would be next to the curb, with parked traffic to the left, providing an additional buffer from moving traffic. Joey Schwartz from the Toronto Bicycling Network says, "I think it is a workable plan that makes the current lanes better and safer. 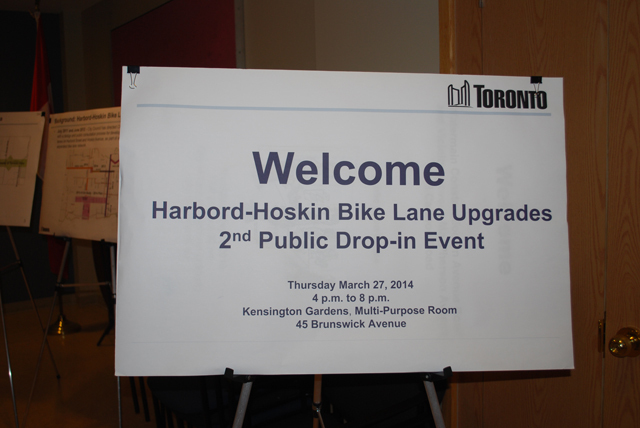 It extends the lanes through the entire Hoskins–Harbord corridor. The buffers add more protection, and give an option on Hoskins to allow film trucks to take the bike lane, and then they will use traffic cones to recreate the bike lane where cars are supposed to park, effectively creating a “separated bike lane”." Sounds like a good plan. And what about future bike lane upgrades and installations? "If we can make this design work on Harbord-Hoskin we can do this on lots of streets and upgrade some of our other bike lanes and improve streets for cyclists all over the city," says the City's Daniel Egan. If you were unable to make the public consultation, you can email your thoughts to bikeplan@toronto.ca prior to April 7, 2014. This is an improvement over the dangerous and costly proposal for bi-directional. But I still gotta wonder why the Ford we’re re-doing an existing bike lane that’s pretty good really when c. 99% of the rest of the City remains in rougher shape, moreso after a very bad set of freeze-thaw cycles enhancing rubble eg. Bloor St. just west of Spadina going westbound. There are at least a dozen other west-central-core things that should be improved for networkings and they too can be done with cheaper paint. And speaking of networking, I really really would have liked to have seen the design for the important linkage between Hoskins and the Wellesley lane – why wasn’t that there? And far more is needed at the other end of Harbord at Ossington like bike lanes on Ossington between Bloor and College as there isn’t too much car traffic there; it needs traffic calming; and the Harbord and Ossington corner is dangerous, though it would be improved. It’s not that salient a “win” for us – the focus on Harbord meant that gee, other NEW bike lane projects aren’t really moving on, so shards of glass to some of those advocating the changes.